Have you ever wanted to go hunt for meteorites? If so, your chance is coming up next month. 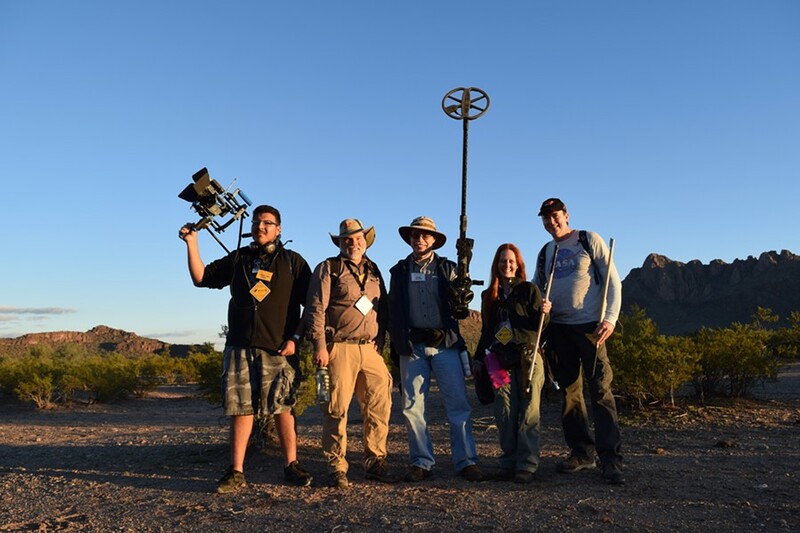 And your guide will be Geoff Notkin, the co-host of the Discover Channel's Meteorite Men program and one of the world's foremost—and most entertaining—experts on meteorites. Your chance of finding one is pretty good: Notkin and his team have salted the desert spread at the White Stallion Ranch with a whole bunch of meteorites—and should you find one, it's yours to keep. "We get everybody geared up with metal detectors, with magnets, with GPS," Notkin says. "We completely outfit these people as Indiana Jones-type adventurers and then I go out in the field with them. I'm so confident that this is going to work that I guarantee everybody that they're going to find a meteorite and they get to keep whatever they find. And there are a couple of bigger pieces buried out there that are in the $500 range." Notkin, who moved to Tucson about a dozen years ago after falling in love with the area when he visited the famous Gem and Mineral Show, has been interested in meteorites since he was kid growing up in London. He had a fascination with both geology and the space program and one day, he realized that meteorites were rocks from outer space. But it wasn't until the 1990s—after a variety of gigs in New York City that included working as an illustrator, assisting in publishing houses and, by night, playing punk music in clubs—that he took up meteorite hunting in any kind of serious way. Through a meeting on the then-nascent worldwide web, he found himself searching Chile's Atacama Desert with Steve Arnold, who would eventually become his co-star on Meteorite Men. Notkin fell in love with the adventure and over time, found himself appearing on a lot of science shows. When a representative from the Science Channel called, he already had a pitch in hand—and before long, he and Arnold were shooting a show about their travels around the world searching for meteors. The show would go on to win two Telly awards and aired around the world on the Discover network. Notkin was aiming for something like "Indiana Jones meets Star Trek—we tried to bring that science and humor and adventure to it, and it changed the world of meteorites forever, for better or for worse. We went from being a funny little corner of academia to this worldwide hobby." Notkin did 22 episodes over three seasons and, even though the show's last episode originally aired in January 2012, he still gets people contacting him, mostly to find out if they've found a meteorite. "There is not a day that goes by where we do not get contacted by someone who thinks they found a meteorite," Notkin says. "That's our legacy." But most of them are false alarms. "Our average is one actual meteorite out of 1,200 inquiries, so the odds are not in your favor," he says. So how do you know if you've found a meteorite? "There are some readily identifiable characteristics," Notkin says. "Virtually all meteorites are rich in iron and will stick to magnets, so we're looking for rocks that feel heavier than they should, that are denser than terrestrial rocks. They typically have a very dark surface as a result of burning in the atmosphere or the iron oxidizing over time. They are sometimes melted into fantastic shapes. So it's visual—we are looking for super-dark rocks that stick to magnets and seem out of place." The full package, which includes meals, accommodations at northwest side's White Stallion Ranch and the training, costs $1,595 ($695 for kids 10 to 17), but Tucsonans who aren't interested staying at White Stallion Ranch can sign on for $1,095 ($395 for kids). "People want to go on real expeditions, but real expeditions to the Australian outback or the Atacama Desert in Chile are expensive, dangerous and the truth is, there's every likelihood we won't find anything at all," Notkin says. "So we have made two replica meteorite strewn fields. The purpose of this training camp is to teach people how to do it."